The Batman Beyond was liked by the people too much because of its unique topic. The super star Terry Mcginnis played main role in it and wore Batman Beyond Jacket. The Batman Beyond was an American animated television series. He looked so nice because of the outerwear and since then this jacket has became a part of fashion world. 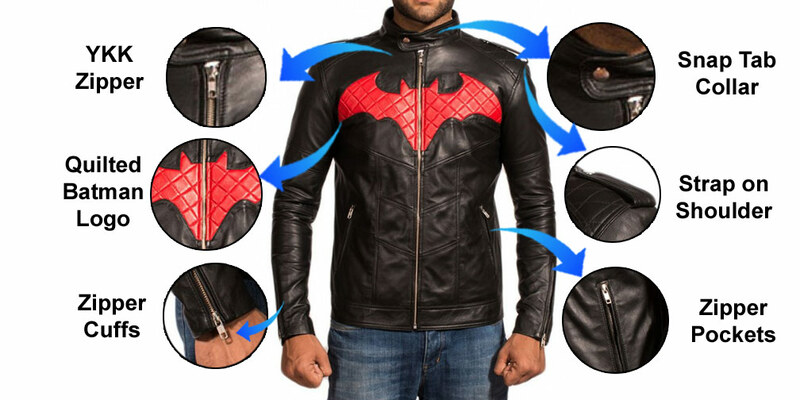 Those who always follow latest fashion style have Batman Beyond Jacket in their wardrobe. They wear proudly when they attend any gathering because of its unlimited features. The outer shell is made from the faux leather or genuine leather. The round neck collar looks fabulous and the quilted viscose inner lining of Batman Beyond Leather Jacket gives you comfortable sensation. The front zip closure is added with snap tab which is quite unique. The special feature of the jacket is “Bat” logo which is present on the front in red shade. The black Batman Beyond Leather Jacket with red logo looks very nice. Two waistlines and two inside pockets are provided in it. The embossed striped designs are on arms and both shoulders. The zipper cuffs of the Terry Mcginnis Jacket form your slimmer appearance.